Abdominal pain in a 93-year-old male. What is the cause? 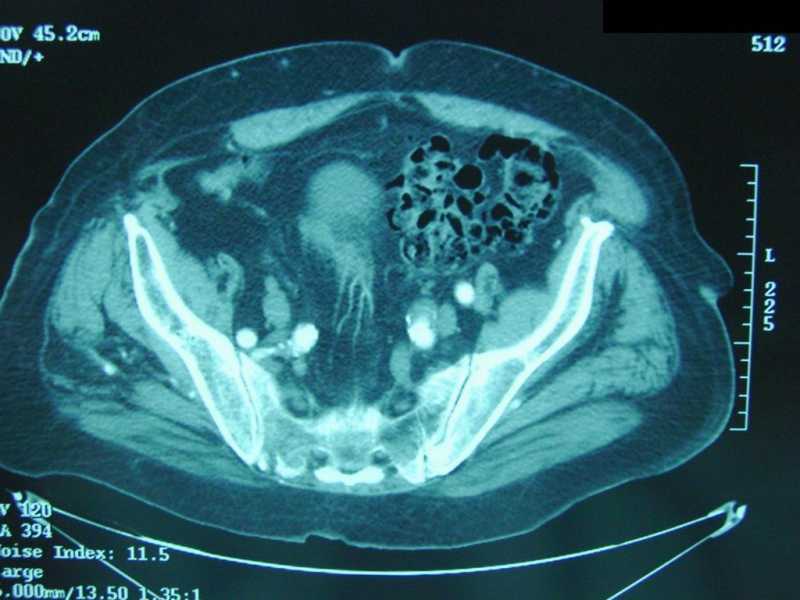 A 93-year-old African American male (AAM) had an outpatient work-up and a CT scan of the abdomen was done. The report is pending. Deep vein thrombosis (DVT) 10 years ago. He drinks 60 oz of vodka daily, quit smoking 50 years ago. Elderly gentleman in no apparent distress (NAD). Vital signs stable (VSS), the rest of the examination was unremarkable. 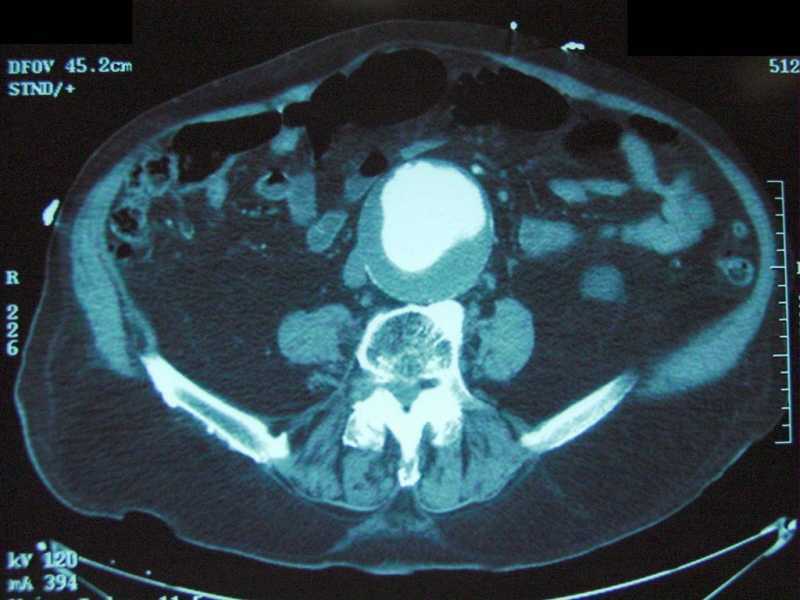 There is a large infrarenal distal abdominal aortic aneurysm (AAA), estimated to measure approximately 8.0 cm A.P. x 7.4 cm transversely. There is a large amount of mural thrombus, projecting posteriorly and to the right, in the proximal aneurysm, while being more circumferential in the distal aneurysm, which extends virtually to the level of the aortic bifurcation. The enhancing lumens directly abuts the anterior wall of the aneurysm proximally, but no definite aortic leak or evidence of retroperitoneal bleed is seen. Old aortic dissection is suspected. There is calcification at both renal artery ostia. GI tract was not well evaluated in the absence of oral contrast. There are fluid density lesions in both kidneys, likely representing bilateral renal cysts; these should be confirmed by ultrasound. No free air or free fluid is seen. There is severe degenerative change with associated spinal stenosis in the lumbar region. Pelvis: There is extensive sigmoid diverticulosis, without obvious CT changes of sigmoid diverticulitis. There is considerable redundancy of the sigmoid colon. 1. Large distal AAA, with associated mural thrombus; no definite aortic leak or retroperitoneal bleed. Old aortic dissection suspected. 2. Probable bilateral renal cysts, which should be confirmed by ultrasound. 5. Severe degenerative change in the lumbar spine with associated spinal stenosis. The abdominal pain subsided. Treatment options were discussed with the patient and his family and they decided on monitoring and conservative treatment. A Large Abdominal Aortic Aneurysm (AAA) and Diverticulosis. Abdominal Aortic Aneurysm. Am Fam Phys, Vol. 73 No. 5, April 1, 2006. Abdominal Aortic Aneurysm. eMedicine Specialties > Vascular Surgery > Medical Topics, 2008. Abdominal aortic aneurysm. Medical Encyclopedia, U.S. National Library of Medicine.